I have not given up, but I have repeatedly disappointed myself over the past few days. I had multiple social events that revolved around dinner and I just didn’t have the follow through and commitment to avoid eating things that were not TWC compliant. At a happy hour that kicked off the weekend, I was mindful but I did enjoy two beers and some chips. I had a bit more staying power as there were healthy options and several people attending were also participating in the Challenge or had done it before. Sunday I ate healthy during the day, anticipating another dinner out. I was poured a glass of wine, so there went that point, and then there were Mediterranean spreads with bread to share. I definitely could have skipped that, but I didn’t prepare myself with a “no bread” pep talk … or at least didn’t make it a firm “no” so I had some. I did order a grilled fish with vegetables and had a cappuccino (lost the dairy point) while everyone else had dessert. I was ready for Monday to kick off a great final week of perfect points … and then attended a huge pre-prom potluck party for my daughter’s senior class. The amount of good looking food was distracting. I held back for a while, but again, let go of my willpower after staring at plate after plate of things I love. I had very small tastes of a few things, but the points still counted. I beat myself up for giving in. I decided: Before attending a social event, I must make a conscious, firm decision about how I will behave in terms of eating. No matter what, the fact is I am distracted by food. I don’t pay attention to what I am eating and yet I find myself thinking about what I will eat next, and even think about missing out on something if I don’t have a taste! When I started writing this post I didn’t know that “social eating” was a thing. 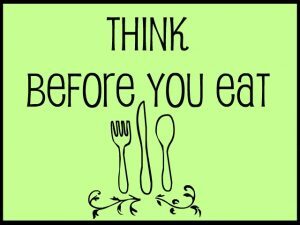 But this article defines it as, “Social eating can be described as the consumption of calories in a social setting whether or not one planned to eat.” The article confirms my strategy of being conscious of what is to come – preparation – is a key to self control in a social situation. Do I Care Enough To Change? And Is Change Possible? One question I ask myself is, “So what?” I don’t actually socialize that much – this weekend was busier than most. Is the solution to stop socializing for fear of eating the wrong things and eating too much because I have no self control? Or, are there steps I can take to develop “coping” skills that will allow me to enjoy myself in social situations without being distracted by food and the eventual regret I feel afterward for having no willpower? Perhaps practicing this next time – being prepared and playing out scenarios ahead of time – will be what works for me. And if so, the more I implement it, the more natural it may become. The Total Wellness Challenge ends in less than a week. But I think I will carry on the lesson learned about self-control, social eating, and mental preparation beyond the TWC.